This is the essence of “backcasting”, a methodology for planning in complexity. It is a play on the word “forecasting”. In forecasting you look at past performance and trends and project them out into the future. For example, a business might make a sales forecast by looking at consumer trends to set at target. There is nothing inherently wrong with forecasting, however when applied in isolation it is of limited value. It would would be like basing where you live only on where you have lived previously (“I lived in Vancouver, then Calgary, so I must move east next!”) or driving a car by only looking in the rearview mirror. Of course we don’t do this. Backcasting gives you a chance to look through the front windshield seeing clearly the road ahead, as well as the tools to imagine the best possible destination where you could arrive and thrive. It is about imagining a very clear future not constrained by the limits of your past experience. This creates a sense of freedom and unleashes new ideas, and new possibilities. And it isn't a flight of fancy. There is a rigour that once you identify the future state of possibilities then you have the tools to develop from the desired future the reasoned, clear path back to your current state. In so doing creating the critical path that projecting the past alone couldn't inspire. 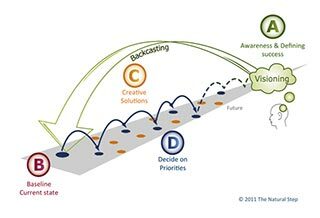 Given the potential, backcasting should also play an important role in planning in organizations, communities and sectors, in particular when there is a strong sense that the current direction that they are headed is not taking them where they want or need to be in the future. Rather than simply projecting out the current direction and accepting it as their future path, backcasting invites people to come together to articulate a shared intention about a different future they want to create and then find new ways of working together to achieve it. The Natural Step has decades of experience helping groups – businesses, communities and sectors – create and realize bold and resilient futures via backcasting. Our approach consists of four interrelated and self-reinforcing concepts commonly referred to as the ABCD. Awareness. Building awareness of the relationship between the organization, community or sector and the society and environment within which it operates. In particular, this involves clarifying the future risks in the way we currently operate, and the business future opportunities in finding new ways of doing things. Baseline <—> Compelling Vision. Creating a compelling vision of where we want to be and taking an honest look at where we are now establishes a shared creative tension that motivates us to act. Down to Action. Brainstorming potential actions and prioritizing them by evaluating how they help us move towards our compelling vision, how they can act as a platform for future steps towards our vision, and how they generate sufficient return on investment to seed future steps. As you can imagine, “ABCD” is not as simple nor as linear as A-B-C-D, rather it is an ongoing process of planning, acting, evaluating and learning. The more we think about the future the more questions it will raise about today; the more we learn about today will expand possibilities for the future; the more we act and learn from actions the clearer the way forward will become, and so on. How do we describe a future that feels bold and ambitious enough to establish a real creative tension that will lead to breakthrough ideas? How do we bring together the ideas, aspirations and thoughts of 40 people into clear and concise statements without them feeling watered down, generic and confusing in the limited time together that we have? How do we fully capture both the challenges and benefits of our current energy system so that we start with a full picture of where we are? We still have a lot of work to do, and know that we need to get it right to be able to realize the full potential of the Energy Futures Lab. We are keen to work together to explore these questions and others, and are looking forward to next steps. Look out for an upcoming blog from Chad Park sharing further lessons from our experience in the EFL and some ideas for moving forward at www.energyfutureslab.com.